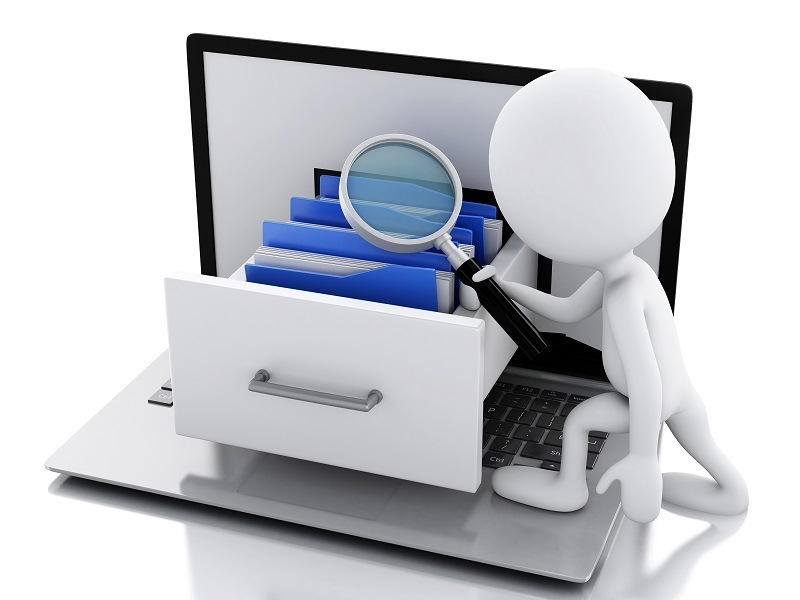 If you have been searching for an online business for sale and found one that meets your desired acquisition criteria, its usually the right time to conduct some initial due diligence to dig a little deeper and see if is worth pursuing. Regardless of how appealing a website looks on the surface, a thorough analysis of the business and the environment in which it operates should help to determine whether or not it is worth pursuing. Seasoned investors often have a structured process that they follow, starting with a reconnaissance run of the business followed by a detailed review of all the available data and trends to understand the crux of the business as well as its current and historic performance. The niche in which the business sits is important for a whole host of reasons. Naturally, most buyers prefer to invest in a niche that they can relate to or have experience in, which forms part of the motivation for potential acquisition. Even if a site operates in a niche in which the investor is passionate, it is critical to maintain a level of objectivity throughout. Asking some of the questions below can help to maintain an objective viewpoint, free of bias. To help, tools such as Google Trends, KeywordEye and Keyword Tool can be used to look at patterns within a niche, over time. Take a look at our list of 105 Free SEO Tools. Understanding the above is important – investing in a highly competitive niche experiencing a downward market trend means that the business is likely to occupy a small market share that is set to shrink further over time. A very important aspect of any online business, traffic is to online business what location is to a high-street shop. If a website is listed with an established broker, it is likely to have Google Analytics installed. Advanced analysis techniques involve a deep dive into traffic data in order to develop independent strategies for user experience, CRO and SEO. At this stage however, it is worth understanding and evaluating some of the headline metrics outlined below. If well-versed in SEO, buyers may look at negative responses to the above in a positive light, weaknesses in some of the areas outlined could be interpreted as lucrative opportunities. That said, if SEO is not a forte, a buyer may not have the experience or resource required to turn around some of the issues being faced by the business. This goes hand in hand with reviewing traffic trends. Google rolls out algorithm updates on a frequent basis – in 2013 alone it was reported that Google made over 890 improvements. ‘Panda’ and ‘Penguin’ updates are carried out routinely with the aim to downgrade websites with low-quality content (thin, duplicate etc.) and those that seek to deceive users (and upgrade others). In 2015 Google also began rolling out a mobile-friendly update, which positively impacts sites that are optimized for mobile access. A check should always be carried out on a website to validate whether it has been affected by an update in the past. This can easily be done using FEI’s website penalty indicator tool. There are also plenty of other resources available that describe how best to tell whether a website has been hit by a penalty or update. 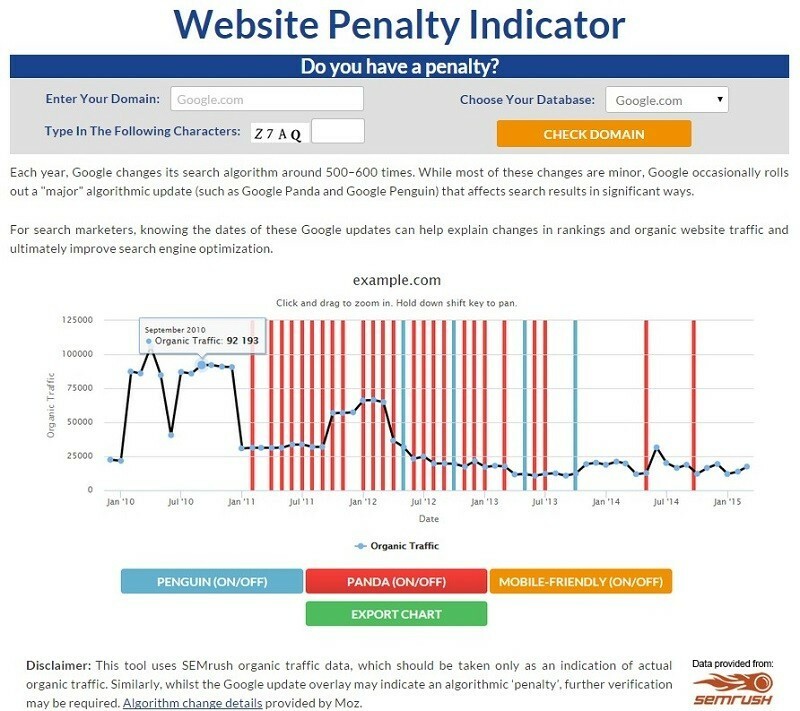 Being ‘hit’ by a Google update or manual penalty indicates that a site is under performing in certain areas. A loss in ranking power as a result is likely to equate to less traffic and impact financials. Unless the site owner has made necessary amendments to the site (which can be explained and verified) and traffic has normalized, buyers should proceed with caution. Validating the accuracy of the income statement is set aside for the due diligence period. At this point in proceedings, buyers should instead look to unpick the income statement, pinpointing any specific trends (e.g. seasonality). A well-diversified set of revenue streams is encouraging, but if the main source is dropping, there could still be a fundamental issue with the business. Traffic and financial analysis should be conducted in parallel with the income statement, telling the story of the business. If traffic trends are on the increase, but financials are decreasing or stable, it could be that there are issues with conversion that need addressing, at a cost to the new owner. 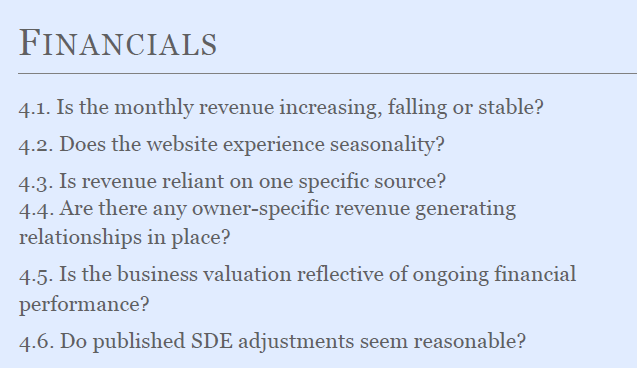 Generally speaking, buyers should look to acquire sites with a history of stable income and should remember to price their time into an offer on the business where the financials are on an SDE basis. Being attracted to an online business for sale that is in the right niche, trending upwards and has a good grounding is tempting. Nevertheless, if a buyer cannot run the site successfully and/or is not well-positioned to take ownership, then this should be noted early in the process. Making a sound investment decision is as much about understanding one’s internal capabilities as it is about spotting the right business to acquire. Looking to buy an online business for sale is an iterative process, requiring plenty of back and forth between buyer and seller. Having completed some initial due diligence, learnt more about the business and put together an initial set of questions, buyers should be sure to speak to either the broker responsible for the deal (if broker represented) or the seller directly. In the case of the former, buyers should take advantage of a broker’s ability to source any additional data that requires assessment. 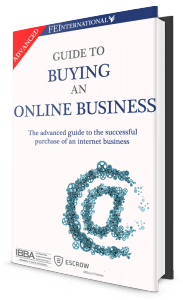 Combining more than ten years of experience, this free 127-page eBook contains all of the information you need to master the profitable world of buying online businesses. To download, please click continue and fill out the short form regarding your buying preferences. James, thanks for this, useful indeed. 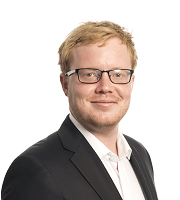 Quick question – how far back should you look when analysing a business? Glad you found it useful and good question. It very much depends on the age of the business. If the business has been around for 5+ years, it would be good to get a firm understanding of trends over the course of the entire business lifecycle. That said, brokers tend to value online businesses based on the last 12 months (L12M). Recent trends (L12M, L3M) are usually a better indicator of the likely ongoing performance of the business. Hi James, another great post! I want to buy an online business but am worried that I don’t know enough about SEO. SEO is just one part of buying and managing a successful online business. Knowledge of SEO is important, but it can be learnt fairly quickly. I’d recommend reading up on Search Engine Journal and Moz etc. Also, remember that the seller will be able to talk through all aspects of SEO (relevant to the website) during post-sale training. Hey James – Great tips here! I will take a look. I came across this post on twitter today – You guys are cranking out some great content! I have subscribed to your mailing list so look forward to seeing whats next. We have new content each Wednesday so keep a look out in your inbox. Really informative post here James. I recently made a considerable online acquisition. I’m now looking to outsource some of the tasks, do you have any advice? Congratulations! I hope you are enjoying it so far. I’d be happy to setup a call to discuss this. We have a host of Management Services in place that could be of use. Feel free to drop me an email – james.morrish [at] feinternational.com. Thanks so much for getting back to me. The Management Service sounds very interesting. I’ve sent you an e-mail. Look forward to hearing more. You hit a home run here. Very concise, yet complete. What percent of organic traffic coming from Google are you comfortable with? Although I’ve been in online businesses for a number of years now and my financial analysis skills are pretty good, I’m not that well versed in analyzing the traffic issues. I’ve printed out this for future reference. Thanks for the comment – glad it was useful! 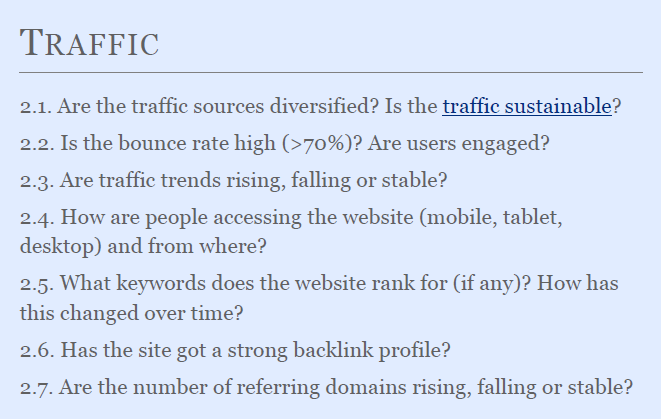 With regards to organic traffic, it completely depends. Rather than having a specific figure in mind, I’d look more broadly at how well diversified the traffic sources are as well as the quality of the traffic coming in from each source – bounce rate, time on site etc. It is worth analyzing each source of traffic, as well as traffic as a whole. An interesting question, certainly. You would have to have tremendous outreach and brand loyalty built up overtime (offline) to rely entirely on direct traffic (online). By very nature, any sort of traffic (whether it be direct or not is ‘online traffic’). If the business makes its money purely online, I think a buyer would want all sources of traffic available to them (including organic). Feel free to contact me at james.morrish [at] feinternational.com to discuss further.